No. 11 Virginia Tech fell to No. 16 Louisville 72-64 in Cassell Coliseum on Monday night. The Hokies dropped to 18-4 overall and 7-3 in the ACC with the loss, while the Cardinals improved to 16-7 and 8-2. 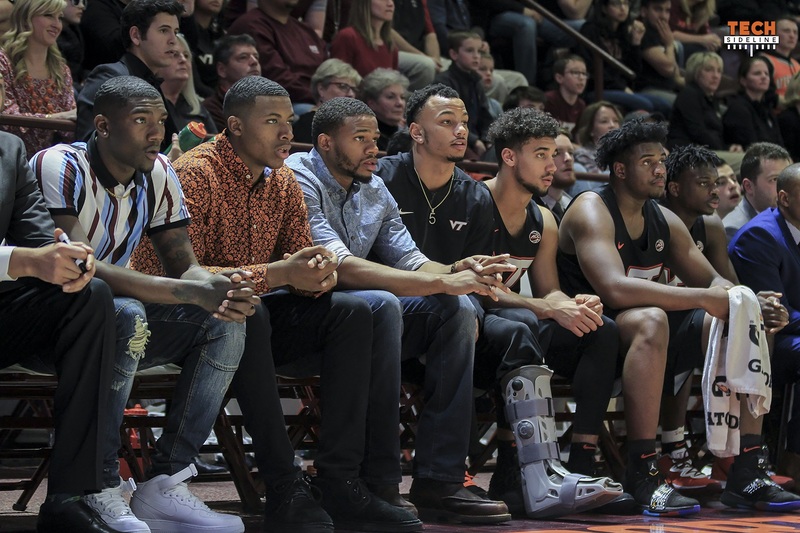 The short-handed Hokies, playing without Justin Robinson for the second consecutive game, used a very small rotation against Louisville, with six players getting 199 of the 200 total minutes. Nickeil Alexander-Walker played all 40 minutes for the second consecutive game, while Kerry Blackshear and Ahmed Hill played 39 minutes each. Wabissa Bede had 38 minutes. Overall, the Hokies got 13 minutes from their bench, 12 of which came from freshman guard Isaiah Wilkins. Tech never led, and every time they made a run to cut into Louisville’s lead, the Cardinals responded with a run of their own. Trailing 31-26 at halftime, the Hokies scored the first four points of the second half to cut the lead to 31-30. However, Louisville responded with a 10-1 run of their own to take a 41-31 lead with 15:31 remaining in the game. Virginia Tech then responded with a 7-0 run, with a three-pointer by Isaiah Wilkins cutting the head to 41-38 with 12:15 remaining. It was at that point that Louisville’s Ryan McMahon came up with the run from which the Hokies never fully recovered. First McMahon was fouled while shooting a three-pointer, and he converted all three free throws. Then he proceeded to make a three-pointer on three consecutive possessions, going on a personal 12-3 run to make the score 53-41 with 10:30 left. At that point he had scored 15 points in just nine minutes of playing time. The Hokies had one more run left in them, but it wasn’t to be. With the score 61-56 Louisville with 3:09 left, Tech stole an inbounds pass, and Ahmed Hill was open under the basket for what would have been an easy layup. Nobody spotted Hill, however, who then sprinted to the corner and missed an open three-pointer. Tech had an opportunity to cut the lead to three points, or even two points, but missed it. At the 1:36 mark, with the score 63-58 Louisville, Dwayne Sutton banked in a three-pointer from the top of the key to make it 66-58, and at that point things were effectively out of reach for the Hokies, who have had just one day of practice to work on their new offense since Justin Robinson went down with his injury on Wednesday night in Miami. The Hokies shot 20-of-45 (44.4%) from the field for the game, but they were just 9-of-24 (37.5%) from three-point range. Ahmed Hill was 0-of-7 from the outside. 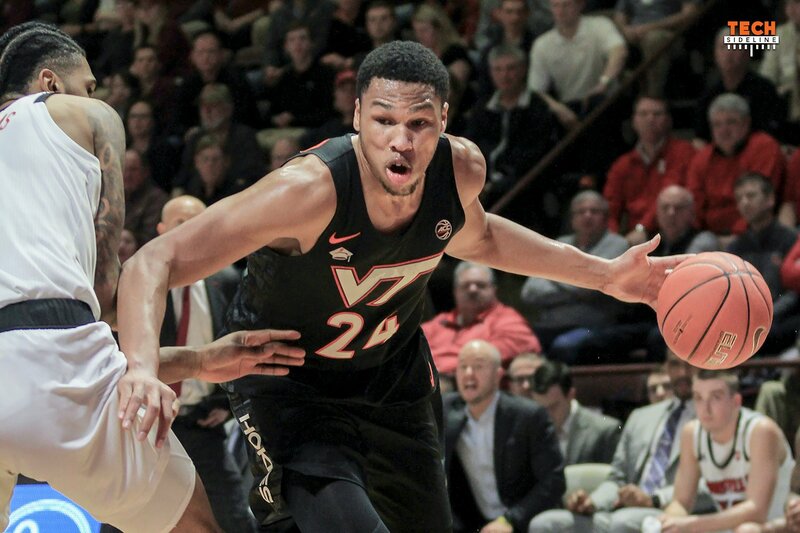 Kerry Blackshear had 21 points for the Hokies. Nickeil Alexander-Walker, in his new role of playing point guard in Robinson’s absence, had 17 points and four assists, but he also had six turnovers. Ty Outlaw had 12 points. Louisville shot a higher percentage from three-point range than their overall shooting percentage. They were 24-of-53 (45.3%) overall, but 13-of-27 (48.1%) from the outside. That includes two big three-pointers that had a huge impact on the game. Besides the banked three-pointer near the end of the game, center Steven Enoch hit a deep three-pointer as the clock expired to end the first half. His shot answered a 6-0 Hokies run that had closed it to 28-20, and it gave Louisville the five-point half time cushion at 31-26. Virginia Tech returns to action on Saturday when they travel to Clemson. Tipoff is scheduled for noon, and the game will be televised nationally by ESPN2. The Hokies entered the game ranked 11th in the AP poll and 10th in the USA Today Coaches poll. Nickeil Alexander-Walker scored 17 points, the 18th time this season he has scored in double figures. With his 21 points tonight, Kerry Blackshear Jr., has surpassed the 900-career point plateau at Virginia Tech. This is his 15th game this season in double figures and his third game of at least 20 points. He now has 917 career points. Ty Outlaw scored 12 points tonight, making 4-of-7 from three-point range. This is his sixth game in double figures this season. He has made at least three three-pointers in 10 games this season. Tonight’s game was sold out, the third consecutive sellout for the Hokies. Ahmed Hill scored nine points, and in doing so surpassed the 1,300 career point plateau at Virginia Tech. He is now 25th in career scoring with 1,304 points. Wabissa Bede tied an ACC game career-high with a team-high five assists. Bede is not giving us any scoring. Is he being defended that well? Hill 0-7 from 3. Ouch! I’ve listened to the last couple of pregames wirh Buzz and he is doing a lot schedule whining. JRob is not playing. That’s plenty of an excuse. I think we all understand that. Great effort tonight. If we play .500 without JRob I will be happy. So far, so good. I’m afraid our chance to get the double bye is slipping away. Were 0-3 with top 4. Two games to go with that group. Damn injuries. Who are the 2 dudes sitting next to Horne? Assume that one is Nolley? Glad that stretch of 3 games in 5-6 days is behind us. Now we get much needed rest. Being forced to play without JRob is going to help the team in the long term, assuming JRob rejoins the team in time for the postseason. NAW could end up improving his draft stock even more after several more weeks running the point. Wonder if Buzz & staff are designing excercises for JRob to maintain cardio fitness while he’s out of action, like swimming. That is a grate picture, all the guys not dressed out. Couple of nice floral patterns in there. Yeah, I can think of a lot of excuses but they played hard and almost pulled it out anyway. I’m kinda livid at the McMahon flop is this now going to be college basketball? Surprised they didn’t review for a flagrant, just gob-smacked. Yeah, he had the hot hand, but why not give the guy three free throws to dial in his range? Also the Blackshear “charge” they were already physically in contact. I’m hoping at least the flop makes Sportcenters top ten so everyone in the country can laugh at it too. This is all good for NAW. Not sure I understand what makes an NBA player and maybe NAW doesn’t need pg skills but this would push his ball handling and vision skills some. Anyway, these guys are warriors. Played intramurals once when only five guys showed up and we all played 40 minutes… and won. never felt more tired or elated. Way to hang. Felt we had a great game plan; but Walker kept trying to be JRob with his passes that ended up turn-overs. Once Buzz gets this “new unit” practicing; I feel everyone will play within themselves. Still a very talented team. Agree. It is almost like A&W is trying to do too much and forces it at times. It looks like Buzz has slowed down the offense, but we still have too many turnovers. With this line-up, we simply can’t win unless we hold the number of turnovers down to 8 or less. The pace dictates that we are only going to get so many shots, so turnovers have more of an impact than we were playing faster (with more possessions). We are really going to struggle without Robinson, but will be capable of doing more when he returns. I noticed every time Bede brought is up, he got to a point and then used his backside to protect the ball. When Robinson brings it up, he is in attack mode and makes the defense come to him, and then hits the open man. The ball movement at that point is much better with Robinson than it currently is with Bede. We are playing a half court game with a full court offense that is being contained in our current format. I have been really impressed with the continuing improved play of Blackshear (staying out of foul trouble, rebounding, good moves), and hope he will begin to perfect scoring when close. Tough one tonight for a tired team. They showed a lot of character by staying close, ready to pounce, but Louisville hit too many 3’s. You won’t win many games when your opponent goes 13 for 27 from 3-point range. The McMahon foul on the 3-pointer was a flop, a poor call that changed the game. We had some momentum until that call, the 3 free throws and 3 more 3’s by him. We are not going to win every game without Robinson, but I was proud of how they kept it within striking distance. We have 3 games coming up that we can win before Virginia and Duke. Let’s win the next 3. I’m not usually one to blame officiating but there were a few momentum-changing calls that could easily have changed the 8 point differential in to something different. We surely had enough problems of our own and I do believe the “better team” won last night but there were plenty of head scratchers at what seemed to be the worst times. It does appear that the home refs are not doing ANY favors at all for us this year in Cassell. Almost like they are intentionally trying to hurt us at times. At the Wake and Syracuse game even when we were up big multiple bad calls seemed to try to help the visitors get back into it. This one especially hurt. I hate to say the refs changed the outcome of the game but the phantom foul on McMahon 100% led to him going on a personal 12 point run. When you give a shooter get 3 free throws he’s going to get in rhythm. Then late in the game when we were on another momentum shifting run, they called a bogus charge on NAW when he was doing a baseline spin move that killed our last hope. I know the home streak was bound to end, but it’s bothersome when it feels like the refs are working against you at home especially. Thanks for better articulating my thoughts exactly!